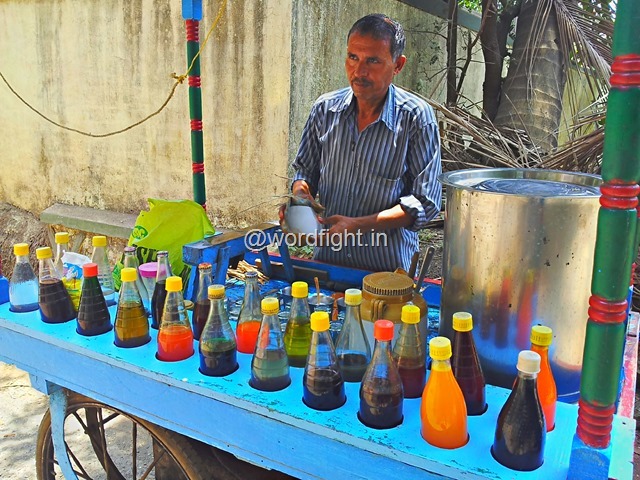 Ding ding ding ding…..The familiar sound of ice gola cart is typical to Indian summers. As kids, we waited with patience, and small change, for the arrival of this saviour from heat, refrigerators being a luxury in those days, afforded by a fortunate few. The gola vendor sold grated ice, shaped into an oval, mounted on thin wood stick and quickly soaked with sweet colored and flavoured syrup as desired by the buyer. What we got was 10 minutes of pure happiness while sucking on the ice and painting our lips an tongue with the color of the syrup used. Nothing could beat the heat as would an ice gola do in those days. We have grown ever since, but the ice gola vendor seems to have found the exilir of life, keeping him young as ever. But our desire for the gola can never fade and on those odd afternoon on holidays, if we hear the familiar ding ding ding, we rush for a glass and some loose change. The ice gola has evoled into glass gola, thus preventing the syrup from dripping down and the loose change is not so loose any more. But there lies one problem. My kids of 2 years, pampered since birth by my parents and in-laws, if ever they realise that ice gola is the most desired street food I would be making round to pediatrician in no time. The best way to hold back this secret from them, till such a time appropriate or till the time that they realise it themselves, is to re-christian the ice gola as Medicine. And the colors and texture of this medicine, being similar to some of the bitter ones endured by them in past, helps reaffirm this masquerade. All this while that we have been enjoying the medicine, they must have been thinking, better them than us. But I couldn’t understand whether to laughout loud or cry when my son, as soon as he heard the ding ding, said in a hurried and urgent tone, mumma, dadda quickly get the glasses, your medicine has come.